“We have been working with Jordan for a period of time now…on a number of issues that have developed as a result of what’s happening in Syria,” Panetta said. He said chief among those issues were the “humanitarian needs” that has developed as a result of the refugee influx into Jordan. “We have also been working with them in the effort to monitor the CBW (Chemical-Biological Weapons) sites to determine how best to respond to any concerns in that area,” Panetta continued. “And we’ve also been working with them to help them develop their own military and operational capabilities in the event of any contingency there, and that’s the reason we have a group of our forces there. They’re working to help them build a headquarters there and to ensure that we make the relationship between the United States and Jordan a strong one so that we can deal with all of the possible consequences of what is happening in Syria,” he added. Panetta’s comments came during a NATO conference of defense ministers in Brussels on Wednesday, where he said the US had been working with Jordan to monitor chemical and biological weapons sites in Syria and help the country deal with Syrian refugees crossing over the border. Earlier in the day Jordan’s military had denied the US military was helping the kingdom deal with the influx of Syrian refugees and other security related issues. “News reports that the United States is helping Jordan deal with the Syrian refugees or face dangers related to chemical weapons are not true,” state-run Petra news agency cited a Jordan Armed Forces spokesperson as saying. The US has previously used Jordan as a base for other Syria-related military activities. 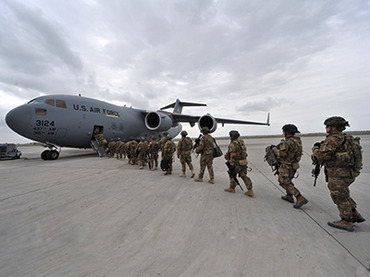 In May of this year, Washington held military drills in Jordan dubbed ‘Operation Eager Lion,’ which saw around 12,000 troops from several nations participate in undisclosed training exercises. A US defense official in Washington said the forces were composed of 100 military planners and other personnel who had stayed on in Jordan after attending the annual exercise in May. Several dozen more had subsequently been flown in, and they are operating from a joint US-Jordanian military center north of the capital, the official, speaking on condition of anonymity, told AP. The Obama administration denied accusations in the Syrian media that the May exercises were a threat against President Assad, and maintained that the action focused on the treatment of refugees, anti-terrorism tactics and naval interception of smuggling vessels. Last week Panetta said intelligence suggested that Assad’s government had moved chemical weapons to protect them, though they are believed to be secure. Jordan has also struggled to deal with the 200,000 plus Syrian refugees Jordanian Foreign Minister Nasser Judeh says have crossed the border since the Syrian uprising began 18 months ago. Jordanian riot police deployed tear gas to disperse Syrian refugees at a camp in the north of Jordan earlier this month after they set their tents on fire and destroyed property to protest their living conditions. US and Jordanian officials had previously discussed the possibility of setting up a humanitarian buffer zone on the Syrian side of the border, the Times reported, but have made no moves to implement the plan. The Syrian conflict took an unexpected turn last week when mortar fire struck across the border at neighboring Turkey, sparking outcry from the Turkish government who subsequently returned fire. Turkey deployed 25 new F-16 fighter jets to reinforce its borders this week as NATO pledged support if the conflict spills into the country again. Since uprisings against the embattled President Assad began last year, the UN estimated that more than 20,000 people were killed in the conflict and some 700,000 fled Syria to seek refuge in neighboring countries.